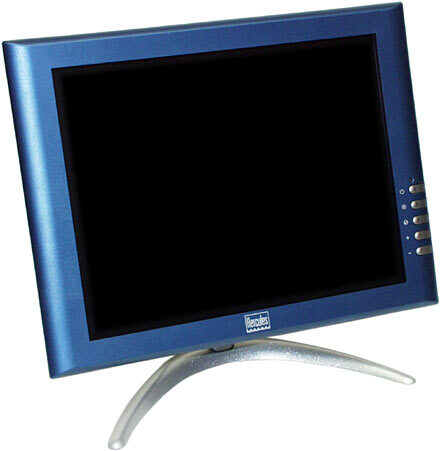 Want a cheap LCD (Liquid Crystal Display) monitor? That's because there are, classically, three basic kinds of cheap LCD screen. Old nasty passive-matrix displays that put LSD-scene-from-Easy-Rider effects on anything that moves quickly, generally aren't very big and can't handle very high resolutions, and often need a special video card (which you may or may not get when you buy the screen on eBay...) to work at all. If you get one of these monitors very cheap (like, for about $US50) and know what you're in for, it's a cool gadget, though not as a primary monitor. If you pay half of the price of a modern LCD, though - and various suckers commonly do - then you've been royally reamed. All cheap LCD monitors use panels made for laptop computers. Laptops with 15 inch screens are becoming mainstream products, but 14 inch and smaller panels are still big volume products, and they're what gets used in a lot of current entry-level LCD monitors. A 14 inch LCD only has the viewable area of a basic 15 inch Cathode Ray Tube screen (for reasons I'll explain in more detail shortly), and really isn't suitable for resolutions above 800 by 600. 1024 by 768 14 inch LCD panels are common enough, but the pixels just end up too darn small for anybody lacking the eyesight of an eagle and the eyestrain resistance of a pixie watchmaker. All current model PC LCDs use the "active matrix" design, in which every pixel on the screen is backed by three transistors, one for each of the barely-visible-to-the-naked-eye "subpixels". One red, one green and one blue subpixel per screen pixel lets an LCD display a full colour image, but three transistors per pixel adds up to 2,359,296 transistors on a 1024 by 768 display. It's impossible to consistently make panels with 2,359,296 working transistors on 'em, so manufacturers allow a certain number of defects per panel. There are rules about how bad the defects can be, how close to each other they can be, and so on. Monitors made with lousy quality panels may end up being sold cheaply, if panel manufacturers unload their high-defect products to cheapo-screen makers, rather than just throw them out. Such a screen might be decent value, if you don't mind the speckles. But if you do mind 'em, it'll drive you nuts. ...this. It's Hercules' Prophetview 720 LCD monitor. It's got a 15 inch screen. Its maximum resolution is 1024 by 768. And it costs only $AU990 delivered. You can get known-brand LCDs a little cheaper than this, but they're 14.1 inchers. Most decent 15 inchers are still up around the $AU1500 mark. A 15 incher for less than $AU1000 can reasonably be expected to be... quirky. But, as it turns out, the Prophetview 720 (or PV720, as I'll call it from now on) is actually pretty darn good for the money. Hercules are aiming the PV720 firmly at the gamer market - people who want a monitor they can carry to LAN parties without straining their ectomorphic little bodies. To be a winner, this screen therefore needs a reasonable price tag, because gamers generally don't have an expense account. It needs solid construction, because LAN-partygoer computer gear gets bounced around in cars, set up on rickety trestle tables, and generally treated with about as much respect as Rodney Dangerfield. It also needs to be able to handle high-frame-rate video, so that gamers won't be made to look totally un-l337 by their blurry screen. And it also needs to look really cool. I'm happy to say that the PV720 more or less passes all of these tests. Now, this isn't a fancy monitor. It's got an ordinary outboard power brick, one non-detachable video lead that ends in a normal 14 pin VGA connector, and no other frills. No speakers, no multi-articulated arm. But whaddayawant for $AU990? The thin frame around the PV720's screen gives it a vaguely wide-screen look, but this is a perfectly normal 4:3 aspect ratio screen. It's got a 305 by 229mm viewable area, which is just about exactly 12 by 9 inches. Those of you with a vague memory of the squaw on the hippopotamus being equal to the sons of the squaws on the other two hides will realise that this means the diagonal must be a genuine 15 inches. CRT monitors aren't specified this way. The same marketing weasels that gave all of the world's hard drives capacities specified in powers of ten instead of powers of two (which means a hard drive manufacturer's megabyte equals 0.93 real megabytes...) have worked their magic on monitors, too; a "15 inch" CRT will never have a real viewable area with a diagonal much bigger than 14 inches. Some monitors have as much as a two inch rip-off factor. But LCDs are honestly specified. Don't ask me why. What this means is that a 15 inch LCD like this one has at least as much screen area as a "16 inch" CRT. 16 inch CRTs don't really exist in the consumer market, but "17 inch" CRTs certainly do, and a 15 inch LCD has about nine tenths of the screen area of even a generous-sized "17 inch" CRT. 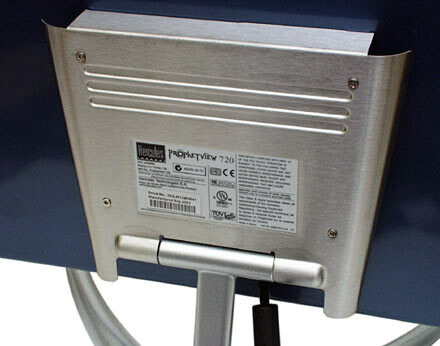 The base of the PV720 is this cast aluminium boomerang, which gives the monitor a pretty solid footing, and allows it to take up even less desk space than the average LCD. The boomerang is held onto the stalk with a couple of large screws; if you wanted to attach the PV720 screen to a different base, it wouldn't be very difficult to do. 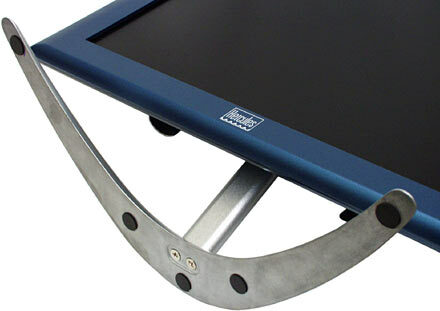 The front of the screen surround is plastic with a blue metallic-flake finish, but the back of the monitor's also aluminium. So this screen ought to be able to put up with pretty rough handling, as long as nothing smacks the thin glass over the LCD itself. Despite all the metal, the PV720 only weighs 3.5 kilos; it's not heavy for a 15 inch LCD. The simple single-hinge screen mount lets the monitor tilt up more than 20 degrees if necessary. It can only tilt down about seven degrees, though. This means that if you set the PV720 up on top of a correctly ergonomically positioned other monitor for multi-screen applications, you'll probably be able to aim the LCD at your face pretty well. But don't bet your life on it. The PV720's control buttons are minimal but effective enough. There's an auto-adjust button to get the monitor to look at the incoming signal and adjust its settings to it, which ought to minimise the amount of the user's life that gets spent fooling with the phase adjustment. And there's also the usual on-screen display menus, with a couple more buttons to increment and decrement settings. Since there's not a lot to actually set up on an LCD - none of the fancy geometry adjustments that Cathode Ray Tube (CRT) monitors need, for instance - you don't need much of a control interface. It'll do. This is a 1024 by 768 LCD, and it can't handle input resolutions above that at all. Lower resolutions are scaled out to fill the screen, not displayed with a black border. Old model LCDs scale lower resolutions onto their fixed pixel grid in very ugly nearest-neighbour ways, and/or display the lower resolution without pixel scaling, but with a fat black border around it. The PV720 doesn't do either of those things; its scaling has the fuzzy look that you'll get from any LCD running below its native resolution, but it works fine. A full-screen DOS session will not give you a migraine. LCDs do not, inherently, give you a better picture than CRTs. Well, not if you're not into razor-sharp pixels, anyway. Yes, LCD pixels have nice sharp edges compared with the fuzzy mapped-onto-several-phosphor-dots pixels of a CRT. But who cares? Do you want to see sharper jaggies? 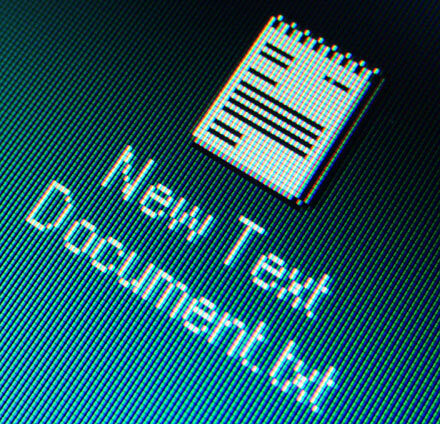 Anti-aliasing is an OS feature these days, folks - although, perversely, subpixel rendering means that font antialiasing works best on LCDs. That's good, because LCDs need more help in this department than CRTs. That said, Hercules' specs for the PV720's panel are good. 230 candela per square metre brightness, 300:1 typical contrast ratio, better than 30 millisecond (ms) response time, and 130 degree horizontal and vertical viewing angle. What? You want the specs in English? Oh, OK. The brightness spec means that this monitor is bright enough to be used in a well-lit environment. All current LCDs are bright enough for that, though; you'll often run them at less than full brightness (or contrast), just to give your eyes a break. The contrast ratio spec, if it's honest, means the screen can manage a large range of brightness from the brightest white it can display to the blackest black. No LCD can display a perfect black, since they work by blocking the light from their backlight, and they can never quite block all of it. CRTs win by a mile for contrast ratio - if their brightness isn't wound up too far then they can display a "genuine" black, no brighter than the screen looks when it's turned off. In a darkened room, a CRT can therefore have an infinite contrast ratio. 300:1 is a good contrast ratio for an LCD. But this isn't a specification on which you should depend too heavily, because there's no agreed way to measure it. I'll get back to how the PV720's contrast range really looks in a moment. The response time spec tells you how fast the liquid crystals in the PV720's panel can change alignment - and thus pixel brightness - in response to a signal. The response time, in this case 30ms, is how long a given subpixel takes to go from off to on to off again. If you want all of your pixels to have finished changing brightness before you display another frame, and if your frames are a simple black-white-black-white sequence, the best the PV720 will be able to manage is 66.6 frames per second, since that full black-white-black cycle takes only three hundredths of a second. Which is pretty good. If the frames are coming any faster than 66.6 frames per second, though, the pixels won't have time to respond to a white frame before they're being told to be black again, and you'll get flickering grey instead. The highest input refresh rate the PC720 can handle is 85Hz. LCDs don't actually have a refresh rate like CRTs, but ones like the PC720 that take normal VGA-cable input still have to deal with the concept. The video card doesn't know it's feeding a digital display and not an analogue one, and electronics inside the monitor take the analogue VGA signal and turn it back into much the same digital bitmap it was before the video card analogue-ised it. Efficient, huh. Considerably higher frame rates than 85Hz are possible on an "85Hz" monitor, in a way, as long as vertical sync is turned off. With vsync disabled (it's an option in pretty much all video drivers, and many games too), each displayed frame can be partly composed of one frame and partly composed of another, so you get to see at least some of each frame from a higher-speed image stream. But these partial frames are still pasted together into a string of not more than 85 discrete full resolution images per second, so that's the fastest real display rate that this monitor's ever going to have to deal with. Try to feed the PV720 a higher refresh rate, by the way, and its analogue-to-digital hardware won't be able to keep up. Given that real video input doesn't often require subpixels to go from full-off to full-on and back again very quickly, a 30ms response time LCD should do a good job of displaying even very hectic first person shooters, right? When you only need, say, half as much brightness change out of a given subpixel, it takes longer to happen. The lower voltage differential between any non-black brightness level and some other brightness level that also isn't black means the pixel responds slower than it would if it were being told to go from whatever brightness it's at straight to black. Which, by the way, is full-on for the subpixel; powered-up LCD cells go black, not clear, which is why your digital watch shows nothing when its battery is flat. Unremarkable mid-brightness oscillations can still easily take twice as long as a full black-white-black cycle. Fortunately, the smaller the brightness change you're asking for, the less you'll notice if the pixels respond slowly, so this isn't as much of a problem as you might think. But it's still worth considering, and it's something that LCD manufacturers are working on. The PV720's viewing angle is OK. The viewing angle is how far away from a line drawn perpendicular to the screen your eyes can be and still see what's on the monitor. The layered-polariser design that LCD screens use mean that they look weird when you're off-axis. CRTs with funky screen coatings can be a bit like this, but LCDs, especially suspiciously cheap ones, are far worse. Since your eyes are always significantly off-axis to at least some of the screen if you're not impractically far away, it really helps to have a broad viewing angle, to minimise the oddness of the image. ...as shown in this close-up angle shot. But that's normal. This effect is a pain if you're trying to do demanding graphics work where accurate tonal reproduction is essential. But it's not a big deal for general computing. To test the PV720's allegedly good response time and contrast ratio, I fired up faithful old Quake 2 and wandered around some of its gloomier levels. Looking at dark images on an LCD is mean; they're commonly not good at showing you the difference between dark, very dark and black. But if you're making an LCD for gamers, you've got to accept that a lot of games look a lot more like a Rembrandt painting than like a Jeffrey Smart. The PV720's Q2 frame rate was fine - maybe not quite up there with a CRT, but not different enough that I could pick it without shooting slow motion movies of the screen. And certainly not the blurry mess that slow response time LCDs make of action games. Q2 was rather dark, though; I was shooting at monsters that I couldn't actually see. The blood-splats, yes, the actual monster, no, in the darker rooms. Winding up the brightness cures that problem. Tweaking the contrast setting from the default 70 to 100 also helps a tiny bit. Pumping Q2's own in-game brightness setting up to maximum helps rather more than contrast tweaking. Going back to the Windows desktop with the PV720's brightness wound up will give you a nasty washed-out screen, but it's not hard to just wind the brightness back down again. If you want finer control over the look of the image when you're doing odd things like playing dark action games, there's always the colour temperature setting. Colour temperature is a standard way to describe colours - the higher the "temperature", the bluer the light. The temperatures, measured in the Kelvin scale that has units the same size as Centigrade degrees but which starts at absolute zero, are how hot an ideal black body would have to be to radiate light of a given wavelength. When you set a monitor's colour temperature to a given value, you determine the overall colour cast of everything it displays. The lower the colour temperature, the redder, and dimmer, the image. For reference, direct sunlight is rather yellow, and has a temperature of 5000K. The light on an overcast day is dimmer but bluer, with a temperature of 6500K. 6500K is a common default monitor colour temperature, and it's what the PV720 uses by default, too. The PV720 has a User colour temperature setting, which allows you to separately set the red, green and blue contributions to the colour that's defined as white. This'll work like the brightness control, if you select the User option and then pump up all three settings - all the way from the default 50 to 100 if you like. By changing the colour levels, you can tune the monitor's colour balance to suit your game, and it only takes a few button presses to go back to the stock 6500K when you return to Windows. People commonly find themselves tweaking the brightness and contrast settings on CRTs when they switch between high-contrast desktop apps and gloomy-toned games, anyway. So the fact that the PV720 makes you fiddle with the screen settings in order to play some games isn't as much of a problem as it sounds. Well, not as much of a problem with the PV720 in particular, at least. I could only find one pixel defect on the PV720 I got for review - but it was a more annoying one than usual. Behold - a stuck-on blue subpixel. Which, more alert readers will note, means that the transistor controlling that subpixel is stone dead and never turns the subpixel on at all. Transistors that constantly power their subpixels result in a much less noticeable black subpixel. Thanks to the dead transistor, if the monitor isn't in power-save mode with its backlight turned off, this one subpixel is on at maximum brightness all the time. The little blue dot is about two-thirds of the way up the right edge of the screen. If the stuck subpixel's pixel is white, you won't notice the subpixel, because it's meant to be at full brightness at that moment. And against the standard Win98 aqua-greeny background colour in the above picture, it's not that obvious. But against black, it is. If this defect had been in the middle of the panel, it would have been enough to require the panel to be junked - or, perhaps, built into a super-cheap monitor for sale to a sucker on an auction site. It's close to the screen edge, so it's allowed to stay. And it is the only obvious defect. But if you buy a PV720 mail order and get one with a defect just like this, tough. This is not grounds for a warranty replacement. 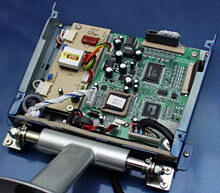 Even expensive LCDs commonly have a defect or two. If you don't like this, I suggest you either buy a CRT instead, or irritate the staff in a retail store by insisting they bring out monitor after monitor for you to scrutinise with your jewellers' loupe until you find one with no visible defects. That's what it'll take for you to be assured of getting a 1024 by 768 LCD with 2,359,296 perfect subpixels. The back of the PV720's a bit unusual to look at, thanks to the curved-edge aluminium armour plate over the electronics. That plate, by the way, comes out of the box with ratty blue protective plastic stuck to it. Because the plastic matches the overall Hercules-blue colour scheme of the PV720, you might at first think that it's meant to stay there, and that you've bought a monitor that's lost an argument with a wire brush. Don't sweat it. Just peel the plastic off. On close examination, the PV720's fit and finish aren't quite world class. 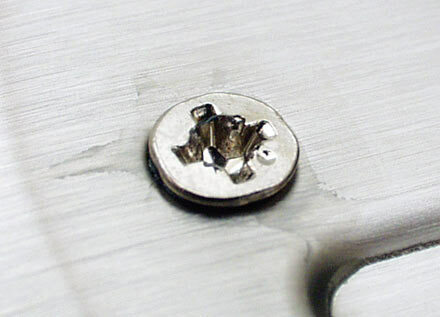 For instance, three of the four Philips head screws that hold the backplate onto my review monitor have reamed out heads. If equipment came out of a Sony factory looking like this, you'd hope someone would be required to commit seppuku. But then again, a 15 inch Sony LCD with a 50ms response time will cost you $AU1300 ex delivery. To see if it'd be easy to connect the PV720 to a different sort of arm - for wall mounting, say - I wrestled the reamed screws out and removed the backplate. Big simple threaded fasteners, folks. It wouldn't be terribly hard to whip up an alternative mounting system. This is the first LCD screen I've seen that I'd seriously consider buying. I've seen some nice LCDs before, and I've seen some cheap ones, but this is the first fairly cheap, fairly nice one. It only costs about a hundred Australian bucks more than a decent 19 inch CRT, it's got decent screen area (about 70% of an allegedly-19-inch CRT's area), it looks good, it seems quite tough, and its image quality is better than usual for a cheap LCD. The PV720's still not worth buying, though, if you're not interested in the particular advantages of LCDs. If you don't have to lug monitors around all the time, and you're not desperately short of space, you probably don't care much about an LCD. LCDs also consume less power and thus pump out less heat - the PV720's peak power consumption's a lousy 24 watts, versus an easy hundred-plus watts for even a basic 17 inch CRT. But if you're not living in a solar powered house, it'll take you a long time for a one hundred watt, or even two hundred watt, power consumption difference to make up for the more than $AU500 purchase price difference between a nice 17 inch CRT and this 15 inch LCD. If you do want to buy an LCD screen, though, check the PV720 out. It's a good LAN party screen, but it'd also look just fine connected to a home or office PC. Its narrow-frame, metallic-blue design actually looks very swish, if you ask me. I think the PV720's perfectly suitable for placement on the reception desk of a company that wants to look high-tech, but has of course bought cheap CRTs for every employee that clients can't see. I stand by my general policy of looking very carefully at cheap LCDs. If you think you've found a bargain in this area, you probably haven't. But I've now looked very carefully at the PV720. And it looks rather good. Aus PC Market don't sell the Prophetview 720 any more, but they've got lots of other LCDs! US shoppers can find tons of monitors at DealTime.